The Nationals showed plenty of firepower Friday night in a 9-1 victory over the Phillies at Citizens Bank Park as Major League Baseball celebrated Jackie Robinson. Michael Taylor hit a leadoff home run and Jayson Werth added a three-run double in the Nationals' five-run first inning. The Nationals scored a run in both the third and fifth innings before Bryce Harper hit a towering two-run home run to right field in the sixth -- the 101st of his career -- to give the Nationals a nine-run lead. "We are battling every day. We are having a lot of fun," Harper said. "I think [manager] Dusty [Baker] raises a lot of emotion in the game, a lot of opportunity for all of us. It's a lot fun coming in here every single day playing the game of baseball." The offense backed a strong start from the Nationals' Joe Ross, who allowed three hits over 7 2/3 shutout innings. The Phillies' rotation had been the best in baseball through 10 games with a 2.14 ERA and 0.81 WHIP, but right-hander Jeremy Hellickson allowed seven hits, six runs (five earned runs) in just three innings. "It wasn't a lot of fun," Phillies manager Pete Mackanin said. "It seemed like we were out of it from the beginning." Ryan Howard tied Joe DiMaggio for 81st on the all-time home run list with his 361st career homer in the ninth for the Phillies' only run. "It's surreal," Howard said. "Sometimes it's hard to think of your name being in the same breath as some of these guys that have played the game before. So it's a very humbling situation. I don't know. Words really can't describe that kind of feeling." Five in the first: Taylor launched the second pitch of the game over the left-field wall, and that was merely a sign of things to come in Hellickson's first clunker of the season. It took him 45 pitches to get through the first inning, in which the Nationals batted around and plated five runs. At one point, Hellickson had thrown nine strikes (in 20 pitches); four of them had gone for hits. "We jumped them early," Baker said about the first inning. "Michael can get you on the board in the first inning 1-0. That's what he did. We got some hits. 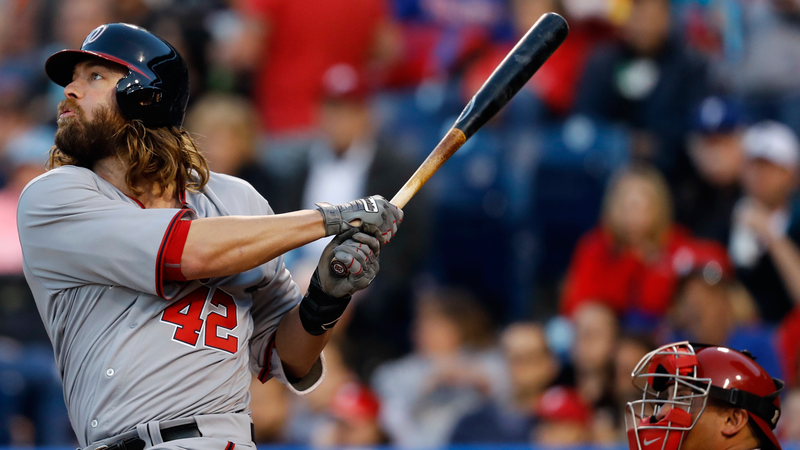 That was a big, big double by Jayson Werth. We had some real good at-bats that inning." "I thought my stuff was good," Hellickson said. "I just didn't command like I needed to. It's an aggressive lineup. I didn't make a lot of quality pitches 0-0, or even with two strikes." Ross' quality start: Ross struck out five and walked two for his second win of the season. At one point, Ross retired 12 straight batters.The only time he was in trouble was in the third inning, when the Phillies loaded the bases with two outs. However, Maikel Franco grounded out to shortstop Danny Espinosa to end the threat. "The Phillies were aggressive, so I had some quick innings on breaking balls and changeups early in the count," Ross said. "I felt pretty good. Fastball command was pretty good. [people were making plays and it all added up." Great night for Harper: A day after hitting career home run No. 100, Harper had a great night at the plate, going 3-for-4 with a home run, two RBIs and three runs scored. He raised his batting average from .250 to .313. Impossible to overcome: The five-run first proved to be insurmountable for a Phillies offense that is expected to struggle to score runs all year. In its first 10 games, Philadelphia had skirted by on the tails of excellent starting pitching and typically one breakout offensive performance to win a ballgame. The Phillies got only two men in scoring position all night before Howard's ninth-inning homer, and that was when Franco stranded all three men on base in the third. Through 11 games, Philadelphia is averaging 2.72 runs. "Obviously we're not hitting the ball very well right now," Mackanin said. "But anytime you get beat up like that early and you've gotta climb out of that hole early, it's tough." The Nationals' 8-1 record is the best start in franchise history (Nationals/Expos) and in D.C. baseball history. Darin Ruf lined out to Werth in the eighth inning as a pinch-hitter. Ruf had not played since Monday after he jammed his left shoulder diving for a ball. Ruf is expected to be in the starting lineup Sunday afternoon against Nationals left-hander Gio Gonzalez. Nationals: The Nationals play the second game of a three-game series against the Phillies behind Max Scherzer Saturday at 7:05 p.m. ET. Washington overcame a rocky outing from Scherzer, who battled through six innings, surrendering four runs on six hits with three walks and six strikeouts against Atlanta on Monday. Phillies: The Phillies will be looking to rebound from Friday's one-sided loss. They sendAaron Nola to the mound Saturday night, hoping Hellickson's outing was merely a blip on the radar, rather than a serious interruption to the momentum Philadelphia's rotation had prior to Friday.